Click the button below to add the CPR162 - CONSTANTINE ANCIENT ROMAN COIN PENDANT WITH BRIGHT PATINA to your wish list. With its magnificent, very rare detail and bi-color earthen patina, this is a stunning ancient Roman bronze coin from the early Christian days of the Roman Empire. This coin was minted during the rule of a descendant emperor from the lineage of Constantine the Great, the first ruler of the Roman Empire to convert to Christianity. The high polished, cast 14 karat yellow gold pendant setting showcases the ancient patina color wonderfully. Perfect for either a man or woman to wear this piece of genuine Ancient Roman history. He said that about noon, when the day was already beginning to decline, he saw with his own eyes the trophy of a cross of light in the heavens, above the sun, and an inscription that said 'Conquer by This' attached to it. Seeing this, he and his army, which followed him on an expedition and witnessed the miracle, were struck with amazement. "He said that he doubted within himself what importance the vision might hold. He continued to ponder its meaning through until he fell asleep. While sleeping, the Christ of God appeared to him with the same sign he had seen earlier in the heavens. God commanded him to make a likeness of that sign which he had seen in the heavens and to use it as a safeguard in all encounters with his enemies." 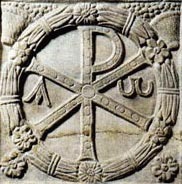 Immediately, Constantine placed the sign of Christ on his standards and had it painted on his shields. Constantine won the day with a decisive victory and Maxentius, thrown from the Milvian Bridge, was drowned when the weight of his armor caused him to sink into the mud and ooze at the bottom of the River Tiber. His body was recovered the day after the battle. From this point on, Christianity became the official religion of the Empire and the capitol was moved from Rome to Constantinople (modern day Istanbul, Turkey). Upon the death of Constantine the Great in 337 A.D., the Empire was divided among his three sons. The eldest son, Constantine II, took most of the Western Europe, the second son, Constantius II, received the entire Eastern Empire and the youngest Constans, ruled Italy and North Africa under the regency of Constantine II.